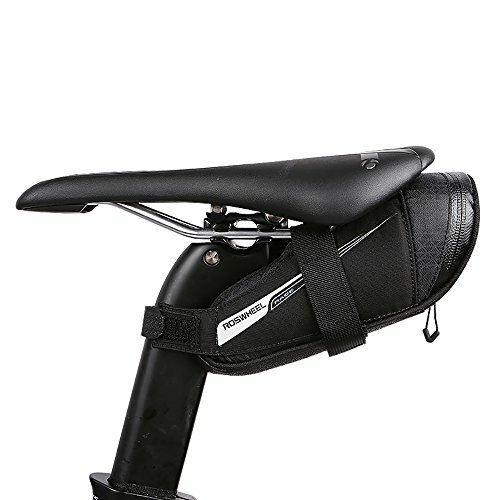 ROSWHEEL Bike Saddle Bag Bicycle Saddle Bag Seat Post Storage Tail Pouch Cycling Road Bike Rear Pannier Road Bike Bag Bike Professional Road Bike Bag Provide you the best Riding-Experience! High Quality: Made of high-end Tear resistant jacquard cloth and YKK zipper is easy to clean and durable. Fashion design and convenient to carry. Velcro strap is easy to installation and release. With a tail light buckle: you can hang taillights on the Saddle Bag for Safety; With reflective logo. 0.6L capacity bag: you can store your glasses, small tools etc.